Roberto Gil de Montes' paintings exist in a hazy terrain somewhere between Mexico and Los Angeles, art history and folklore, a memory and a dream. His works are tapestries of life as it exists around us and as it lives in our minds, weaved together into two-dimensional fields. His colors are as buttery and sharp as morning, rendered with the soft edges of a legend partly forgotten. "Hecho en México," a new series of neo-surrealist artworks, are the perfect antidote to gallery trends and their clever emptiness. "I paint as a way of discovering stories hidden within myself, peeling away layers, digging deeper each time, revealing images of forgotten stories," Gil de Montes says in the gallery statement. 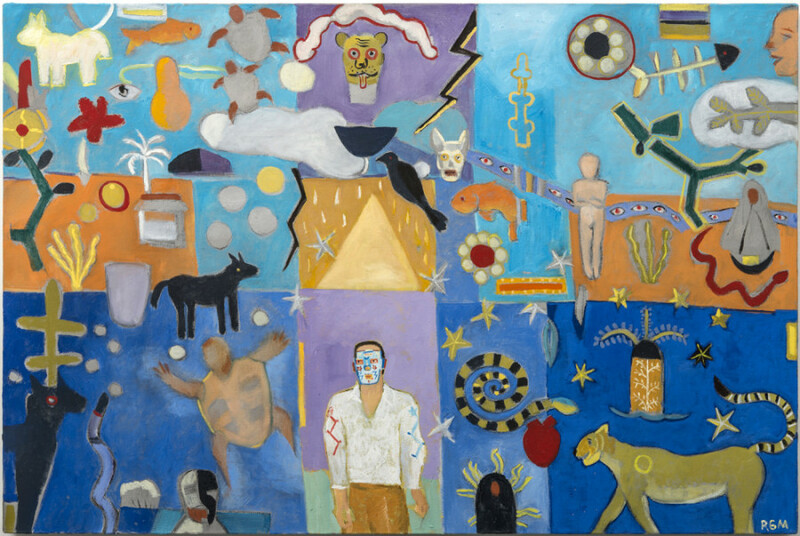 Gazing upon his artworks feels like traveling through time, unearthing Pre-Columbian symbols and painted allusions without a singular guide to navigate the journey. "Rather than merely depicting the world, Gil de Montes invites viewers to physically experience it," the L.A. Times wrote in 1996. "His painting's stark, jarring contrasts and highly animated patterns stimulate your retinas, causing your body to respond well before your brain has a chance to intervene." In his works you'll recognize reincarnations of Paul Gauguin's "Spirit of the Dead Watching" and Henri Rousseau's "The Sleeping Gypsy." Yet scroll further and you'll see a delicate rendering of a shirtless selfie of two men entitled "Facebook Photo." Despite the thematic leap from mythical badlands to social media uploads, the sense of mystical possibility lingers. The electric potential lies in every colored mark, each one drawing the viewer deeper into a vibrant land where enchanted tigers and computer screens can coexist. "Hecho en México" runs from April 5 until May 10 at Lora Schlesinger Gallery in Los Angeles. See a preview of the work below.